The group phase of the EuroCup Women is drawing to its conclusion with just one round of games to be played. However 13 teams have already qualified and will use the last round of games to improve their ranking for the eighth-final brackets. Basket Landes secured their qualification the hard way on the road. They turned the ball over 31 times and also took 20 shots less than ZKK Partizan Galenika. Jennifer Humphrey silenced the home fans with 50 seconds left in the game with an And-1 play to give the lead (57-55). Humphrey's next act was on the defensive end with a block on Iva Roglic. The victory was sealed with a split pair from the charity stripes by Anaïs Le Gluher-Cano (58-55). Thes host did have a chance to force overtime. But in a night going 0-of-18 from the free-throw line, it was too much to expect them scoring with a trey on the buzzer. The good news for Basket Landes and their not known opponents in the eighth-final of the EuroCup Women is that a capacity crowd of 3100 people should be expected at the game. In the other game from Group E, MBK Ruzomberok despite losing to Sdent Helios (78-87) have qualified alongside Basket Landes. In Group H USO Mondeville have also qualified for the next phase by beating Spartak Noginsk (64-52). Mondeville have to thank Touty Gandega who was a pillar of strength all round the court with 17 points and 3 assists as well as the spark that kept her team-mates going. Elitzur Ramla did not play this week. They had already qualified and secured first place in the group. Spartak Noginsk are out and can now concentrate on the Russian Super League. In Group A, Botas Sports club maintained their perfect record with a road win against BC Horizont (90-70). For the winners Quainna Chaney had 18 points while both Marina Kress and Monica Wrights scored 16 points each. Lombos-Cascais stunned WBC Dynamo Moscow (77-74). The Portuguese side have now completed their programme and are eliminated. However BC Horizont who have also completed their group phase could qualify for the next phase if next week Botas beat WBC Dynaamo in the final group game. In Group B, the Lotto Young Cats recovered from a disastrous first half (19-35) to beat and eliminate Dynamo-GUVD (64-61) from the competition. Once again Emma Meesseman (left) was in the headlines with her double-double of 10 points and 14 rebounds. 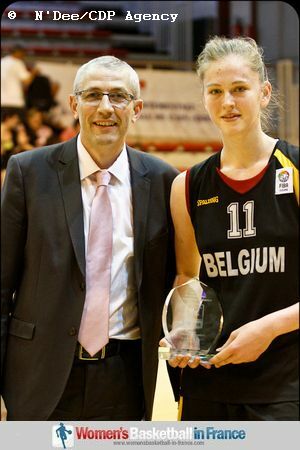 Yet it was the clutch shooting from Jana Raman (15 points) and an energetic cameo performance from Julie Vanloo (8 points and 2 assists) that put the Belgium side on track for victory. Courtney Vandersloot fired in 23 points for Besiktas in their (71-51) road victory against Telge Basket. Besiktas win ECW group B.
Nantes-Rezé had five players in double digits. Yet they were beaten by Dexia Namur (86-76). 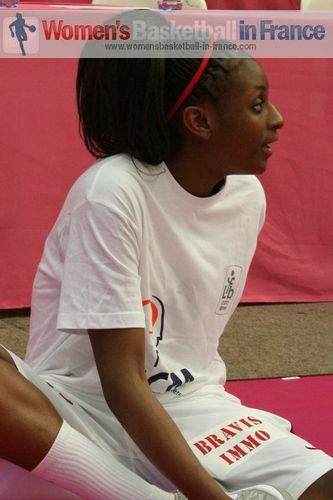 They were unable to stop - for the second time - Ifunanya Ibekwe who scored 26 points as well as picking up 10 rebounds. Her team-mate Laurence Van Malderen added 21 points. With Optimum Ted Ankara beating the already eliminated AD Vagos (79-56), three teams are tied for first place. If Nantes-Reze lose next week they will be eliminated. In Group D, Hainaut Basket - already qualified - were beaten on the road by the Flying Foxes (53-63). Gran Canaria needed a 26-point and 16-rebound performance by Astou Ndour to get by Lemminkainen (69-64). For Group E, BC Chevakata from Russia rearranged their schedule so as not to make back to back trips to northern Europe. They will play their fifth round match on Sunday in Belgium and on Wednesday Arras in France. Chevakata are already qualified. Arras made light work of SISU Basketball (97-49). Dynamo Kursk maintained their 100 percent record in beating Maccabi Bnot (72-60). However the surprise result from Group F came from the already eliminated Olimpia Grodno beating Kayseri Kaskispo (97-76).